Hello everyone! 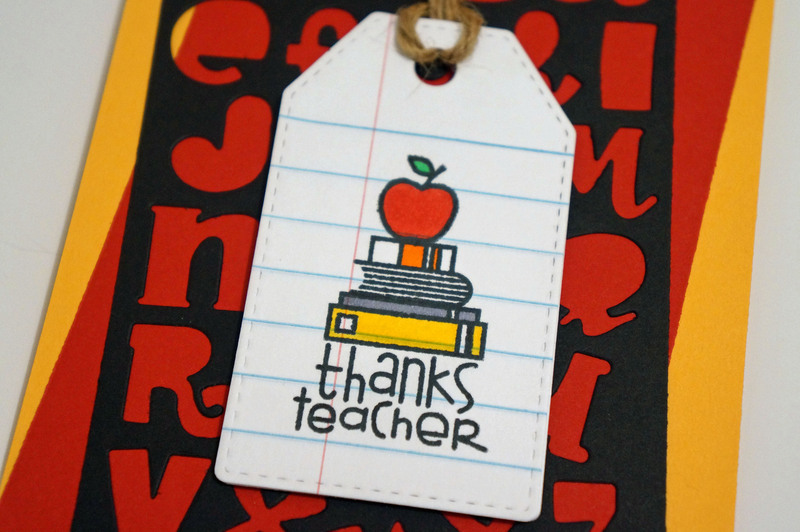 Teacher appreciation week is fast approaching and I wanted to make a thank you card with my new Paper Smooches stamp set, Smarty Pants. I’m also submitting this in Paper Smooches SPARKS Anything Goes Challenge for week 3. Some of you might remember the black negative paper I had left over from my card “A Sassy Thanks”. I still had it lying around in my craft room and thought it would make a cute background for a card. I knew I wanted to use red and yellow paper for this card but I went back and forth with different colors for my tag and then I thought what better paper to use, than a regular wide ruled paper from AJ’s binder? I put it over white cardstock so it wouldn’t be so flimsy. This is my first tag die and I love it, I wish I would’ve ordered this sooner. I finished it off with twine and colored in the apple and books with Copics. I can’t wait to give this to AJ’s teachers (I need to make another one), I hope they love it! Thanks for checking out today’s post, I hope you guys enjoyed!